No business software would be complete without exceptional capability to track your incoming payments. Cyrious integrates your Accounts Receivable with your banking system, your inventory, and your order completion. The point-and-click interface makes it easy for your employees to post payments to the system. Activity Manager records each payment an employee posts, providing managers easy access to records should disputes arise. Before any payment entries can be made, the Company must be selected. This can be done by entering the Company Name manually or by selecting the Explorer button and nominating the required Company. Payment options selection buttons provide quick access to all of the types of payments available in Cyrious Control. Select the appropriate button and the options available for that payment type will appear in the lower half of the payment entry screen. 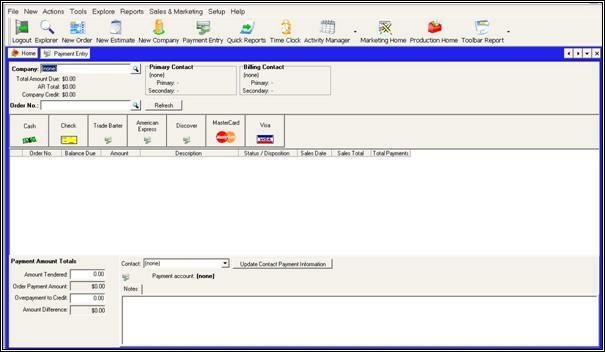 The Order Details for the selected Customer appear in the window directly below the Payment Options. When the Invoice Number is selected, the Amount (in blue) is automatically filled in. The Status or Disposition may be changed at this point – select the ellipsis button and then the Station or Status you want to change the order to. When payment entry for that client has been entered and updated, you can then select the next Company and repeat the process. Company Expands with a few options for viewing the company and displaying reports pertinent to the company. Total Amount Due Displays the total amount due for payment from that company. AR Total Displays the total amount of money received from that company. Company Credit Displays the amount of credit available to the company. Primary Contact This option is available after you have entered a company name. Enter the contact name to which you are billing time. You have the option of using the selection list to search for it. Billing Contact This option is available after you have entered a company name. Enter the contact name to which you are billing time. You have the option of using the selection list to search for it. Cash Select if you are accepting a cash payment. Check Select if you are accepting payment by check. The window will prompt you to enter in a check number. Trade Barter Select if you are accepting trade barter. The window will prompt you to enter details. American Express Select if you are accepting payment via American Express. The window will prompt you to enter credit card information. Discover Select if you are accepting payment via Discover card. The window will prompt you to enter credit card information. MasterCard Select if you are accepting payment via MasterCard. The window will prompt you to enter credit card information. Visa Select if you are accepting payment via Visa. The window will prompt you to enter credit card information. Other payment options, such as eCheck, are available from Cyrious. Please contact us if you would like additional information. Amount Tendered The amount the customer is paying. to Credit Additional money a customer is paying. Some customers may prefer to pay $100.00 instead of $97.42, and then the overpayment will go to their credit account. Amount Difference If the amount appears in red, the customer is not paying the entire bill. If the amount is not a zero amount, Cyrious will not allow you to process the payment. Contact This option is available after you have entered a company name. Enter the contact name to which you are billing time. You have the option of using the selection list to search for it. Update Payment Information Click this button to update the customer's financial record with the payment information you have entered in this box. If you have a fast-paced business, it is a good idea to integrate at least one swiping machine with Cyrious. When you choose to apply a credit card payment, you can then swipe the card, rather than having to type numbers in. You can also access the payment screen when you have an order window open, or by selecting the Post Payment option when right clicking on the order from the order grid in Explorer. Processing eChecks (electronic checks) is available with the purchase of standalone software. For more information, contact http://www.CyriousSoftware.com.